With our product comparison, you will find the suitable product quick and easy. 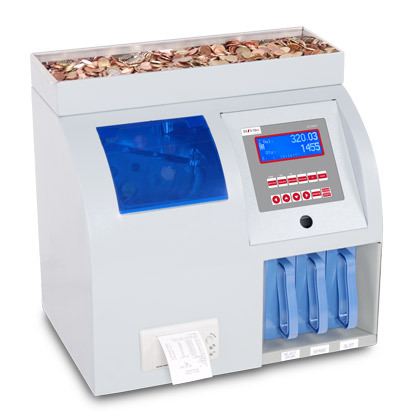 High-speed coin counter and sorting machine to sort out selected coins. 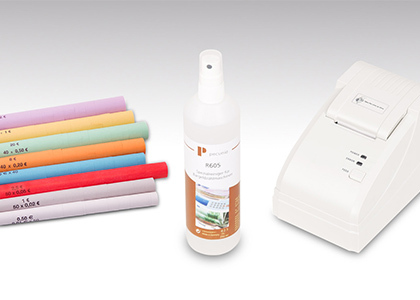 Pecunia offers machines to you - such as banknote counters, coin counters and counterfeit detectors. 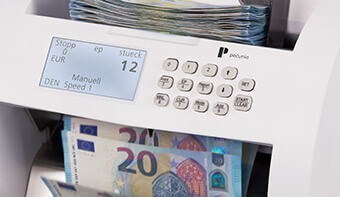 Pecunia covers the whole area of cash handling - thanks to various solutions out of our range of products for bill counting, coin counting, coin sorting and counterfeit detection. If you have to handle a lot of cash payments in your business, your cash counting machine will pay off in very short time. Counting machines work much more faster and more reliable than it it is possible by hand. Employees or cashiers can make mistakes - a bill counter or coin counter still works perfectly after a hard working day. 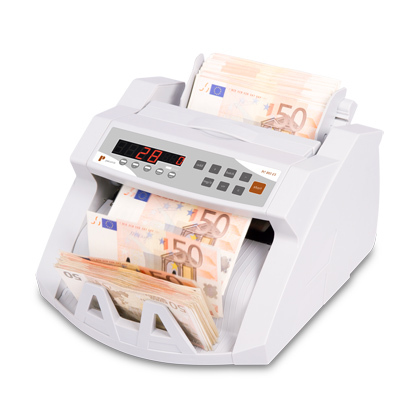 Furthermore, banknote counters and coin counting machines count your cash in less time than humans are able to do (from 200 till 2,500 banknotes or coins per minute!). 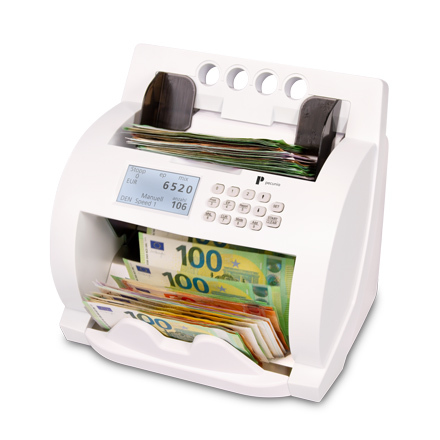 Moreover, you have the possibility to order a counting machine in our Pecunia shop, that is able to check the authenticity of banknotes at the same time. 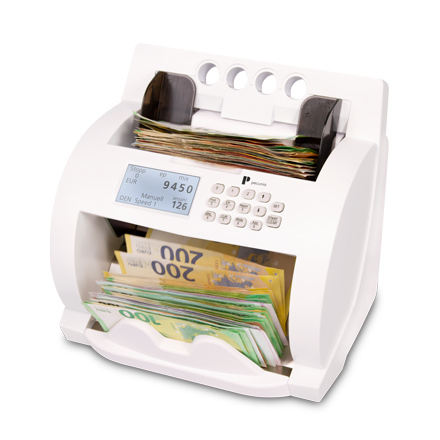 We offer the appropriate cash counter - according to the individual needs of your business. 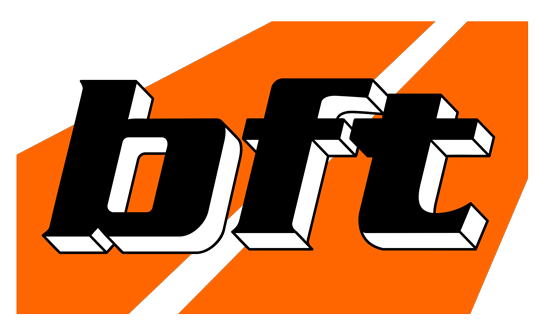 Entry standard, e. g., ist the note counter PC 800. 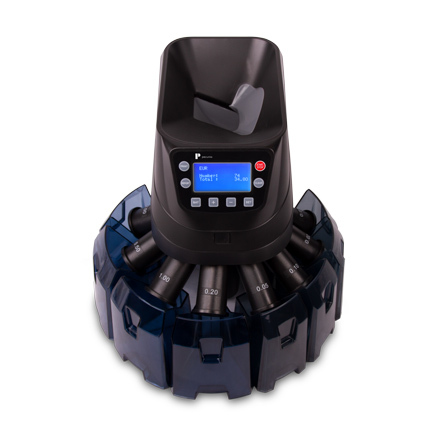 This entry product is applicable for many currencies and counts up to 1,000 bills per minute. However, this model does not yet have detection functions. 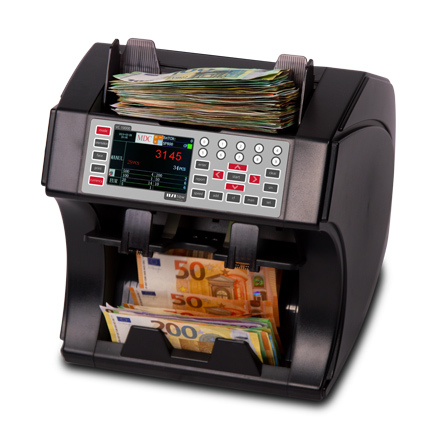 If you prefer to buy a money checker, we recommend to you to choose one of our banknote counters with counterfeit detection (e. g. PC 800 E3, PC 900 SE3 or PC 900 WE3). These currency counters have got a triple counterfeit detection. 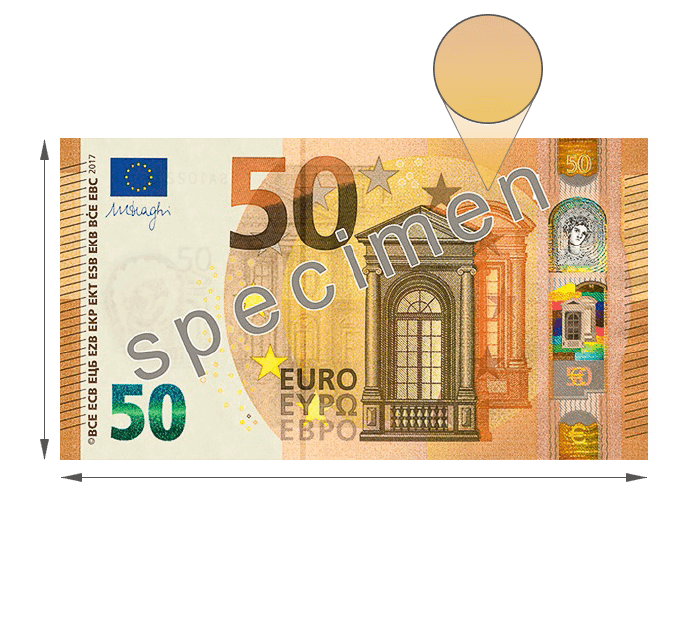 They check three main security features on authentic banknotes during the counting procedure: ultraviolet (UV), magnetism (MG) and infrared (IR) security caracteristics. If you often have to handle coin counting, too, Pecunia not only offers currency counters and currency checkers, but also special coin counting machines and coin sorting machines. 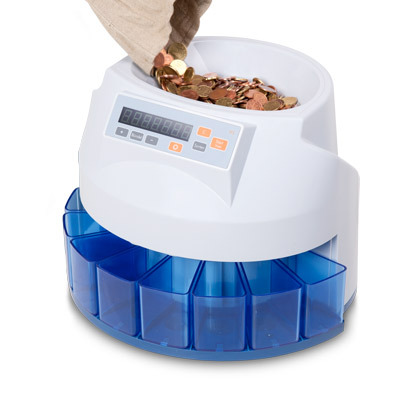 These handy coin counters are very cheap with Pecunia and you can rely on them at any time. 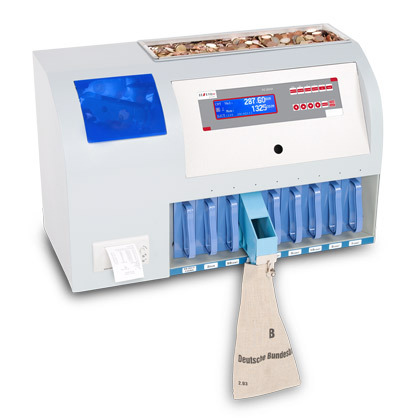 Dependant on the model, the coin counters count between 200 and 2,500 coins per minute. Some of these machines are coin sorters which means, that they are also able to sort the coins at the same time. 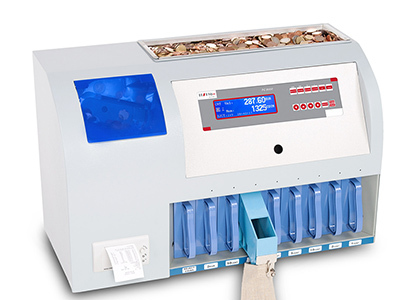 Please feel free to contact us if you are interested in one of our cash counting machines, bill counters, coin counters, coin sorters or note testers - we will be pleased to offer to you our whole service! 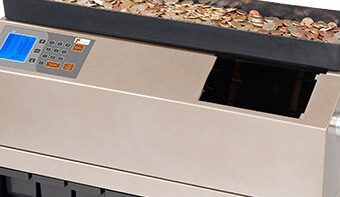 We are convinced that you will find the proper machine according to your needs and wishes for your cash handling or counterfeit detection. Many satisfied customers already trust in our solutions for a more simple and more secure cash handling, money counting and protection against counterfeits. 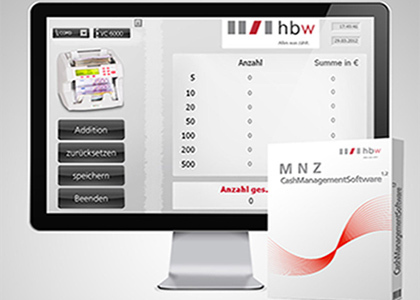 hbw cash solutions is an innovative provider of equipment for money processing systems. We are specialized in this field and therefor we can offer our customers a comprehensive technical and commercial support for the optimal arrangement of the entire money processing. 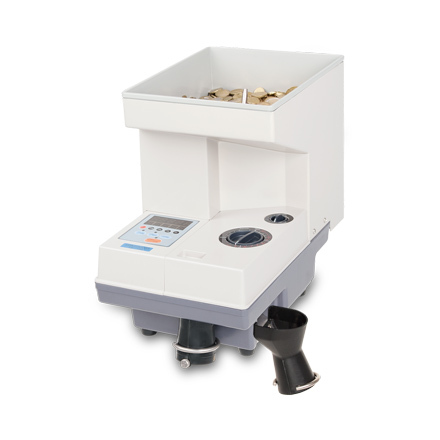 Simply contact us, we are sure that we will find the right money counting machine or the matching coin sorter for you. 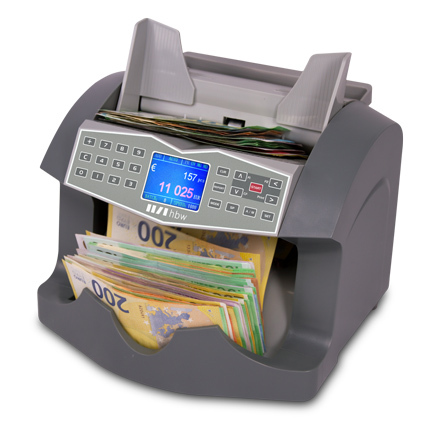 To ensure the security for you and your customers, we optimize periodically the counterfeit detection features of our money counting machines and counterfeit detectors. 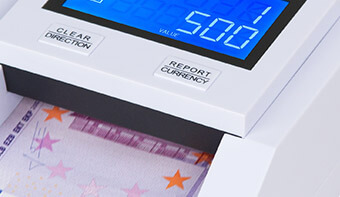 To detect the latest counterfeits and to react accordingly, we work together with the European Central Bank. Counterfeit is still a big issue that can cause a major financial loss for all companies that work with cash. Moreover, not only companies but also their customers are at risk, if the counterfeit notes should not be recognized and get back into circulation. Another advantage of cash processing systems is the saving of time (wage costs) for example, POS accounting. For every requirement there is a suitable counting device, whether mixed evaluation or sheet counter, batch function or addition function, with or without counterfeit detection. 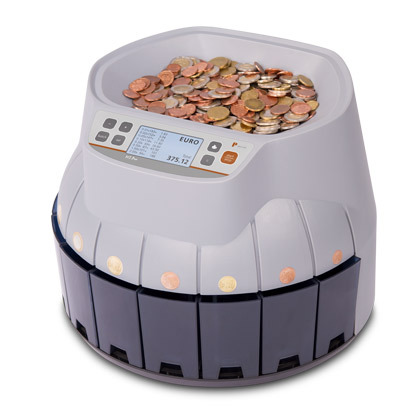 A money counting machine is worth the investment, find out by yourself. 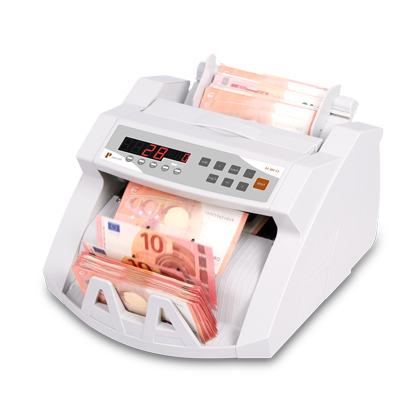 A money counting machine is not only to make the daily work easier, but also to increase the security. Thus incorrect counting result should be avoided with a money counting machine. 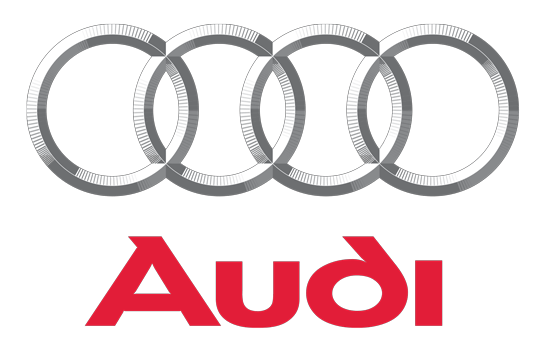 In addition, the security at taking counterfeits will be enormously increased by the integrated counterfeit detection. 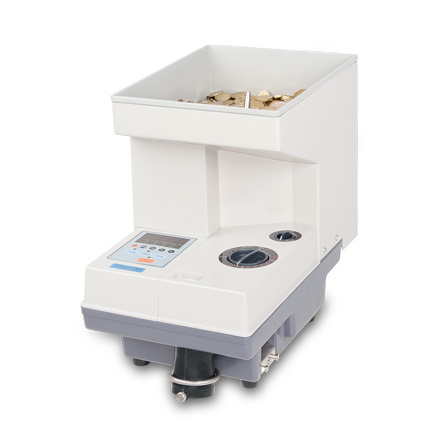 Whether coins or banknotes need to be counted, the count security is an important part of the principle of money counting machines. For daily repetitive tasks, such as counting by hand, can quickly occur one or two mistakes in the heat of the moment. A money counting machine helps to restrict this source of error in one in a thousand. 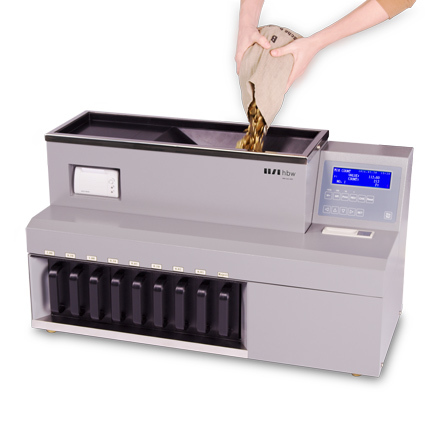 Also for reasons of hygiene, purchasing a money counting machine could be worthwhile. Admittedly, counting the money always carry the contact with cash, but there is a big difference if you have to count by hand every bill and every coin and thus get in contact with many bacteria or if merely the cash is inserted into the machine and remove it after the counting procedure. 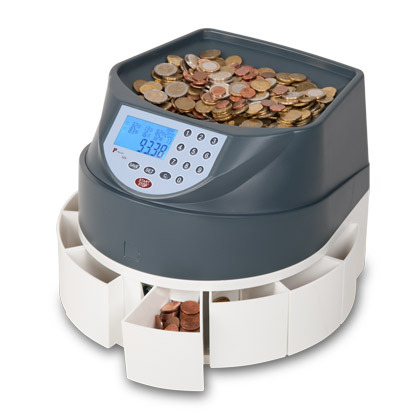 The use of a money counting machine can therefore have a positive effect at different levels for you. Contrary to many opinions and forecasts, the cash in Germany stays stable. 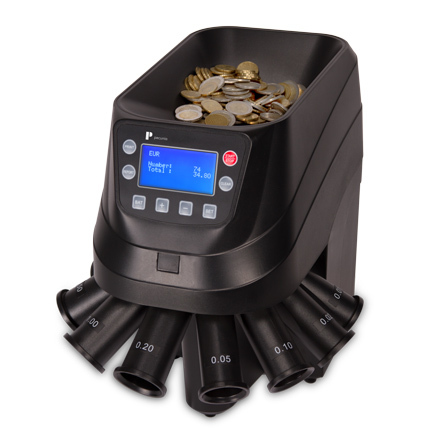 The purchase of a money counting machine is always an investment in the future. Surely, the cashless payment has its charm, but it carries risks and disadvantages as we think. From our point of view, you as an entrepreneur, are able to buy your money counting machine at a price you want and thus move freely. On the other hand, customers can not be monitored when they are paying with cash. Because of that, companies just do not know what you buy at which time, at what price, etc. In near future, this information will certainly be transmitted to all modern cashless payment methods. If you combine this with other technologies, store owners will know how much time you spend on the shelf, in the store itself and see all of your buying behavior. A creepy imagination as we think. For that reason, cash will last a very long time in countries like Germany, certainty in our view. 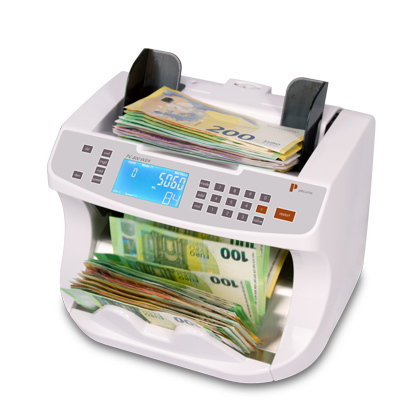 As a rule, a money counting machine amortised after several weeks or months. 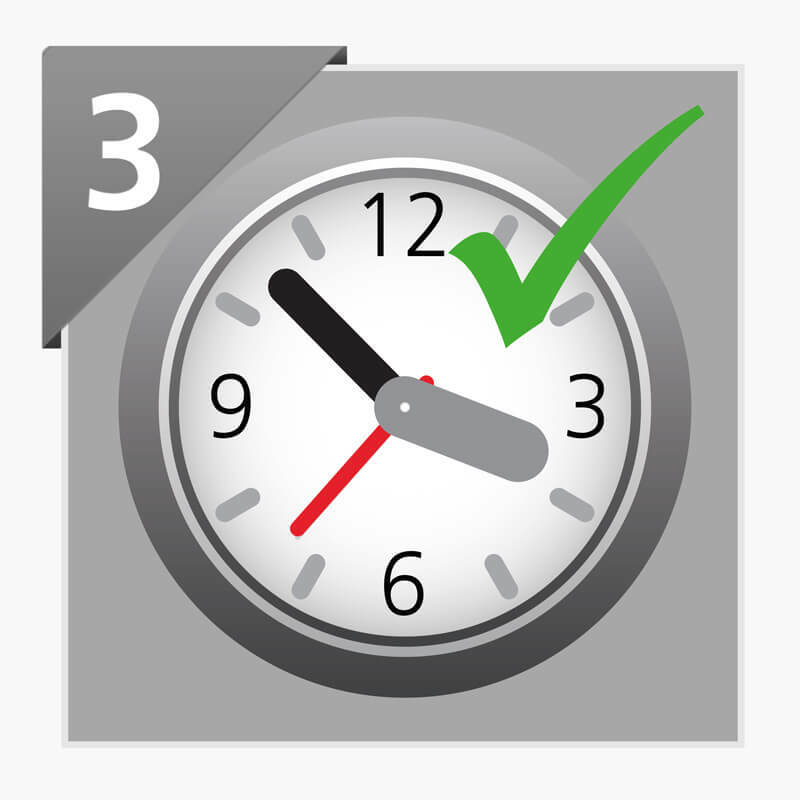 The daily time saving of a money counting machine with correct application and integration is enormous. 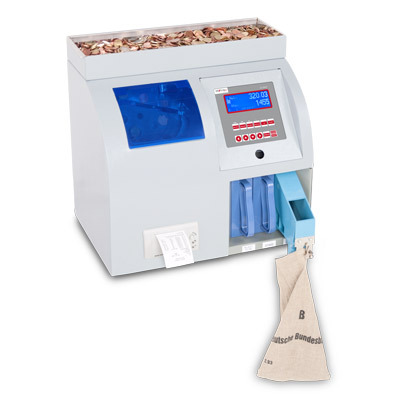 Count cash with a money counting machine saves time for you and your staff and thus labor costs. 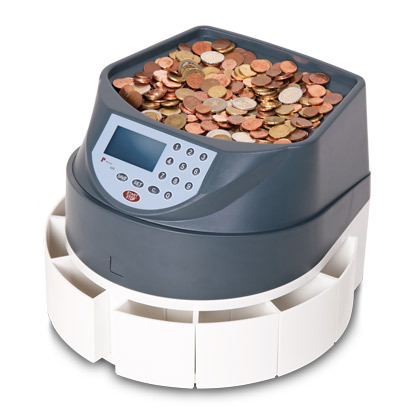 Even at smaller companies and less cash flow you can surely save 15 minutes per day by using a money counting machine. 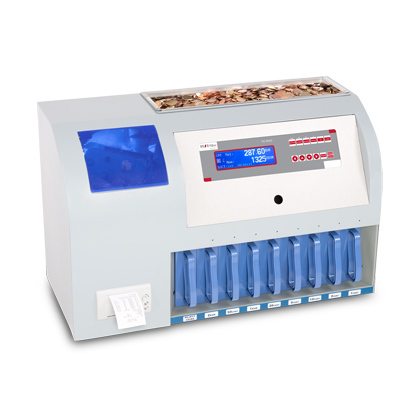 Banknote counter should facilitate and speed up the daily money counting enormous. Thereby the top models of banknote counter are lavishly equipped. 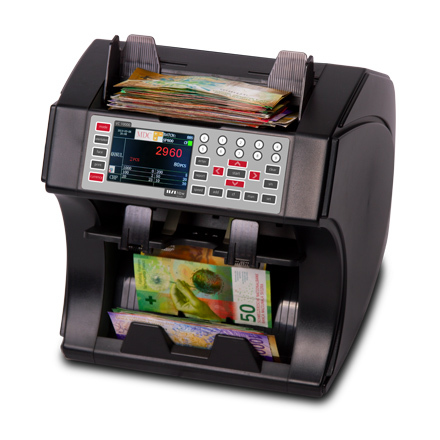 The technology of banknote counter ranges from counterfeit detection sensors such as modern infrared sensors to CIS scanner modules for the expandable value recognition of banknotes. In the area of counterfeit detection, modern banknote counter also have sensors which can check the following features: Ultraviolet, infrared, magnetism and reading the security thread also called magnetic code. 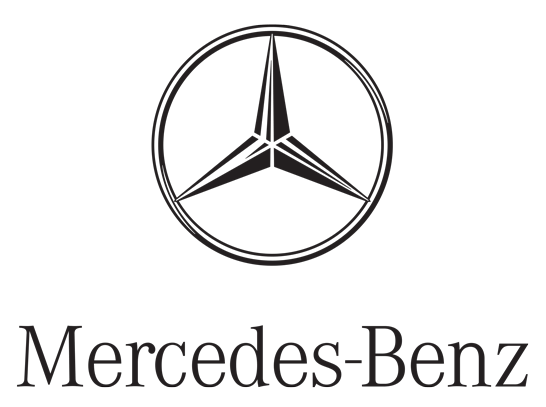 Here, it always depends on the used model and its features. 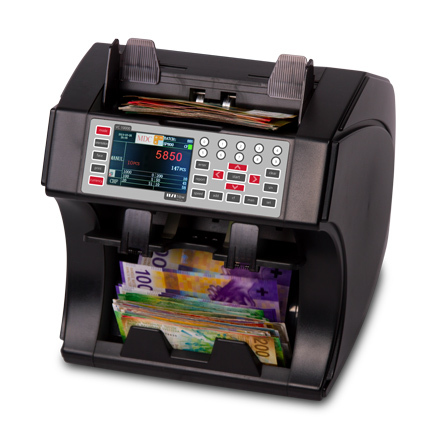 It ranges from the single banknote counter for the range of applications such as a gas station or the highly complex modern banknote counter with CIS scanner for larger bank branches, gambling casinos, etc. 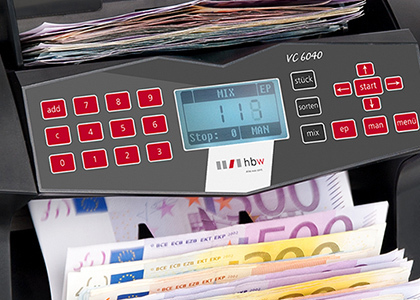 The help through a banknote counter not only captivates by the enormous time savings in banknote counting, but also by the high accuracy of a banknote counter. Even if the human often thinks he counts completely correct, smaller counting differences can happen. If you miscount yourself at the coin money, often the dimension is low and it can be registered as a small cash difference. However, if the error occurs when counting the banknotes without a banknote counter, the effects are immediately apparent and it must be counted again. The counterfeit detector is running fine. We already detected a couple of bogus banknotes. 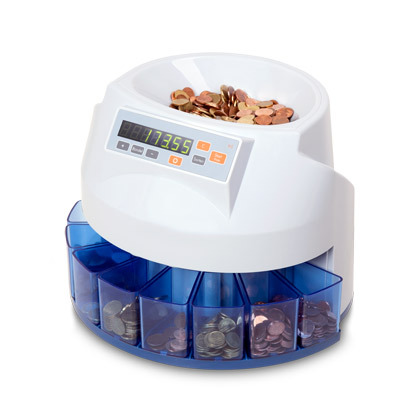 Every day in use - the coin counter fulfills its tasks optimally. As already announced with the purchase, we had to maintain our machine now. This was done within only 4 days - thanks to the quick hbw customer support. hbw machines meet our expectations. We like the counters as they save a lot of time and in the end - money. We have the bill counter for 5 years now - in daily use to count our notes. There is nothing to claim. The machine works without any problems. hbw cash solutions exceed our expectations. hbw was the correct decision. 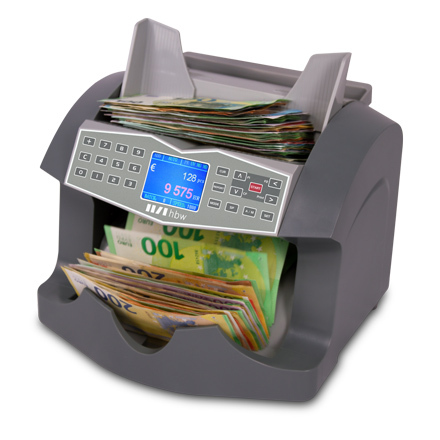 We save a lot of time with our cash handling now. The machines count without any problems. In the meantime, we use the Pecunia banknote counters in nearly all branches. The counting machine is very nice. 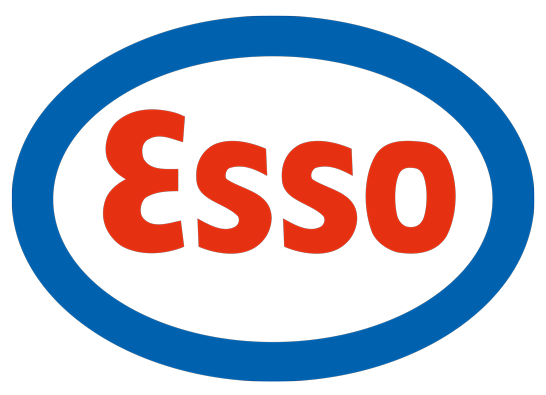 We use it for more than 2 years now - without any problems. I had never imagined that I could save so much work with a counting machine. © 2019 hbw cash solutions All rights reserved. 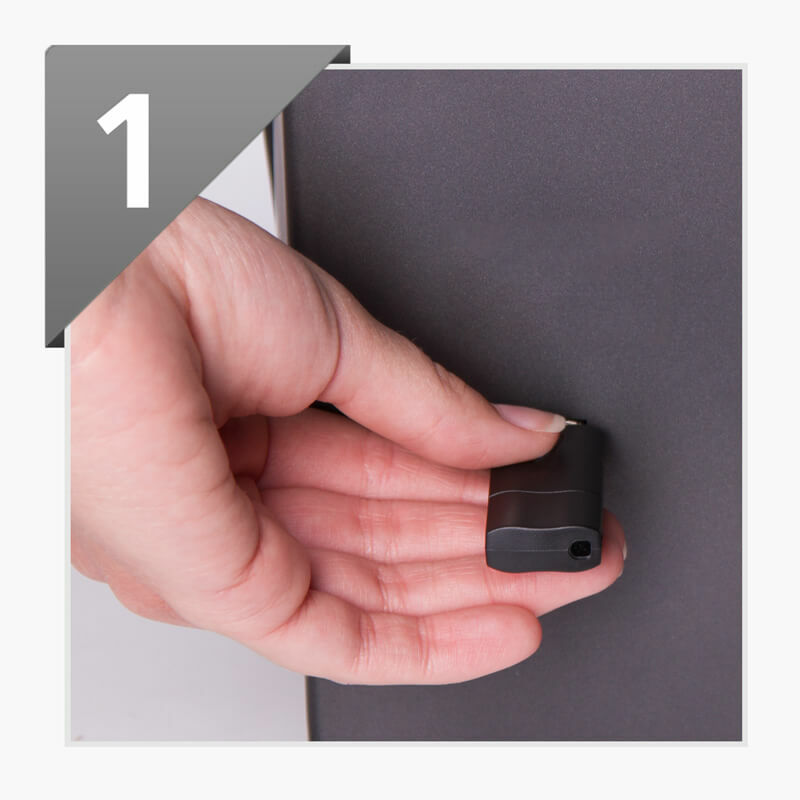 Use the advantages and order directly from the manufacturer. 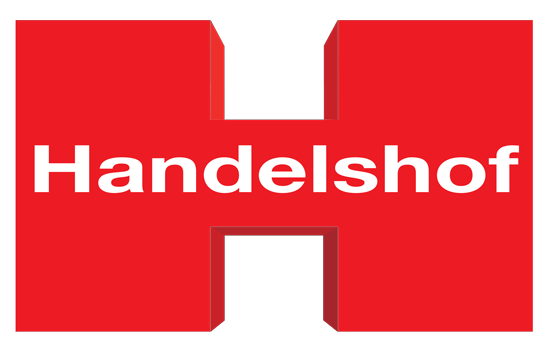 Benefit from short delivery times, excellent after sales support, a reliable spare parts supply and our workshop. 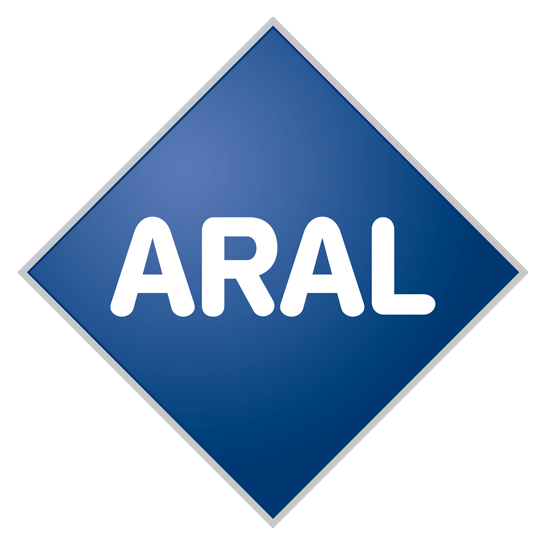 Manufacturer of money processing equipment have the opportunity to test the integrated counterfeit detection of their devices at the European Central Bank. 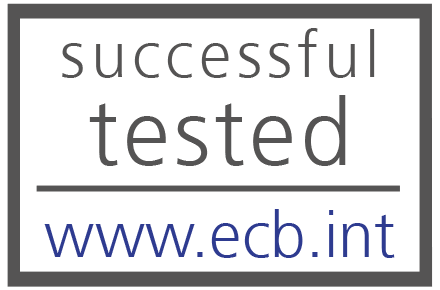 Results of the tested machines can be found at www.ecb.int. 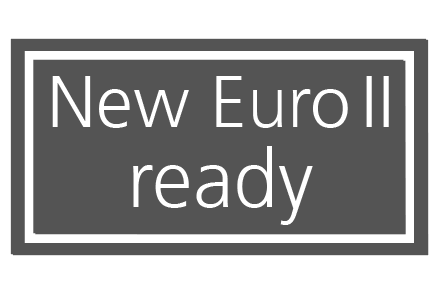 Our assortment is ready for the new Euro banknotes. 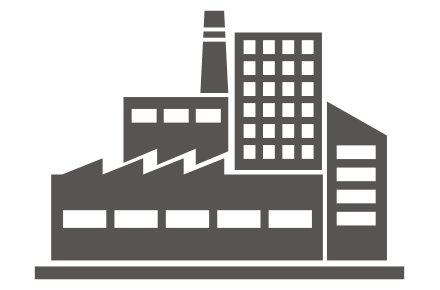 For all affected machines, please find an indication at the product page. 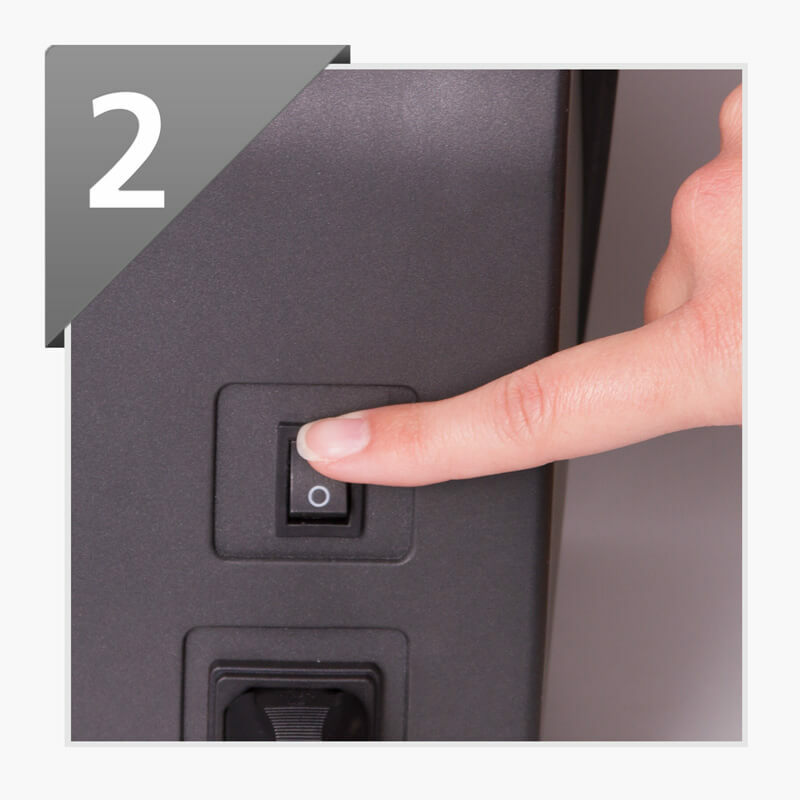 When the machine is switched off, please insert the update-stick into the USB socket. When you switch on, the update-stick is recognized and the update starts automatically. After a short waiting time the update is installed and the machine is ready for use. As a manufacturer of money processing equipment, we are convinced of the quality and longevity of our products. 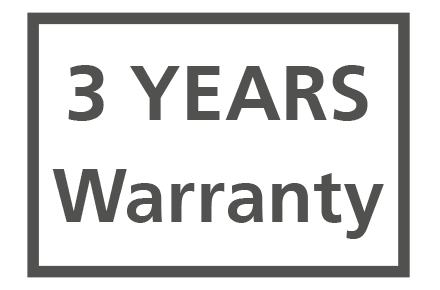 Therefore we grant a guarantee of 3 years on all devices. SECURITY is a top priority at hbw, so all data transfer connections are secured by us with an SSL encryption from GeoTrust. 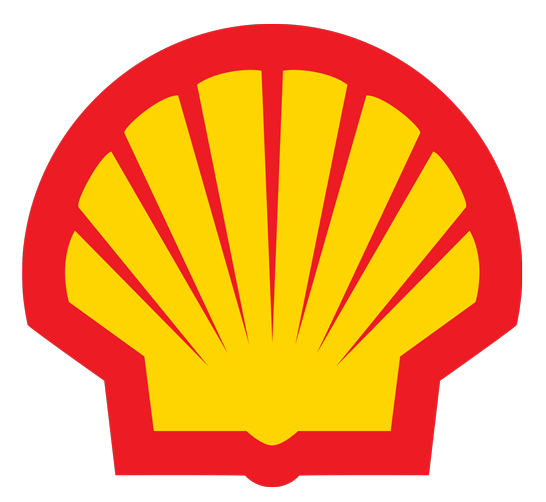 Click on the icon to learn more about our certification. For most browsers you'll find a certificate display in the address line just next to the favorite icon. 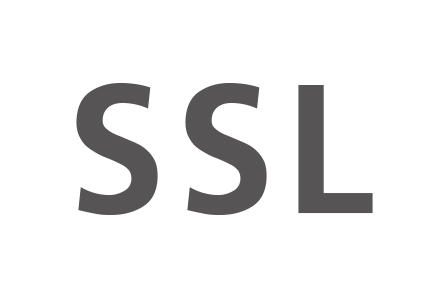 In addition, SSL encryption is always implemented via https in the browser. 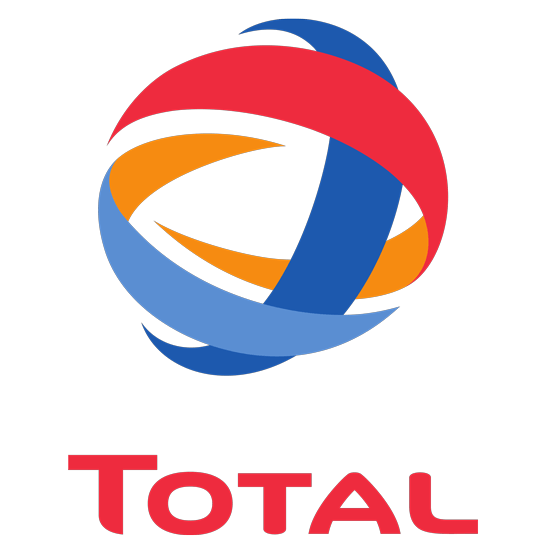 We will be happy to advise you in all aspects! You have some questions? We will gladly advise you, without obligation and free of charge. Call us! 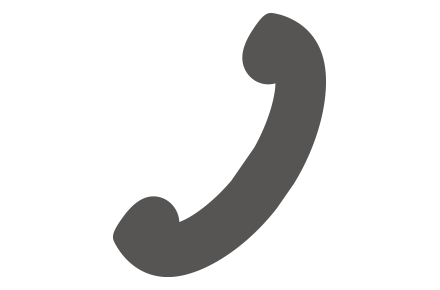 +49 (0) 71 64 / 800 69 12. Order till 15:30 for delivery at the same day. 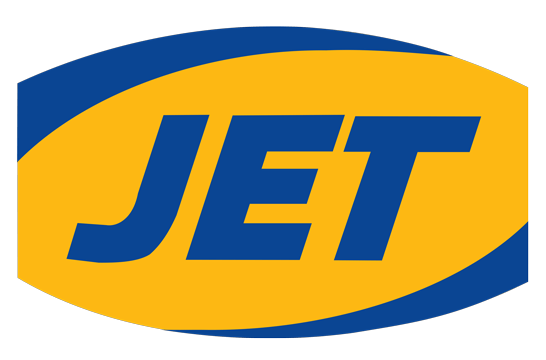 Uncomplicated, fast and reliable! 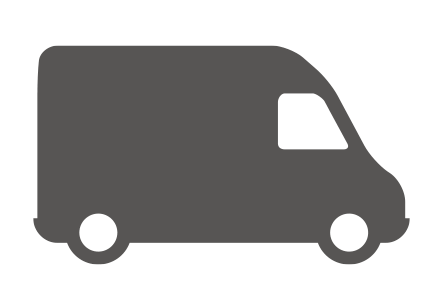 For deliveries within the European Union, you have the possibility to enter a valid VAT-number to order VAT free. Accurate measurement of the width and height by our certified measuring method. 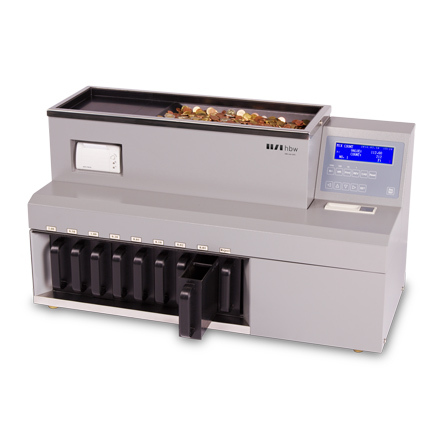 This machine determines the value of the banknote by detecting the colour and size of the banknote. 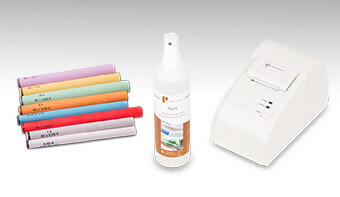 The modern colour measurement method detect the colour of the banknote by means of a sophisticated sensor unit. Furthermore, the banknote is measured in height and width by means of a further developed light barrier technology. The precise detection of the colour, height and width of the banknote serves to accurately recognize the value of the banknote. The coding of the magnetic code is used in addition to determine the value. 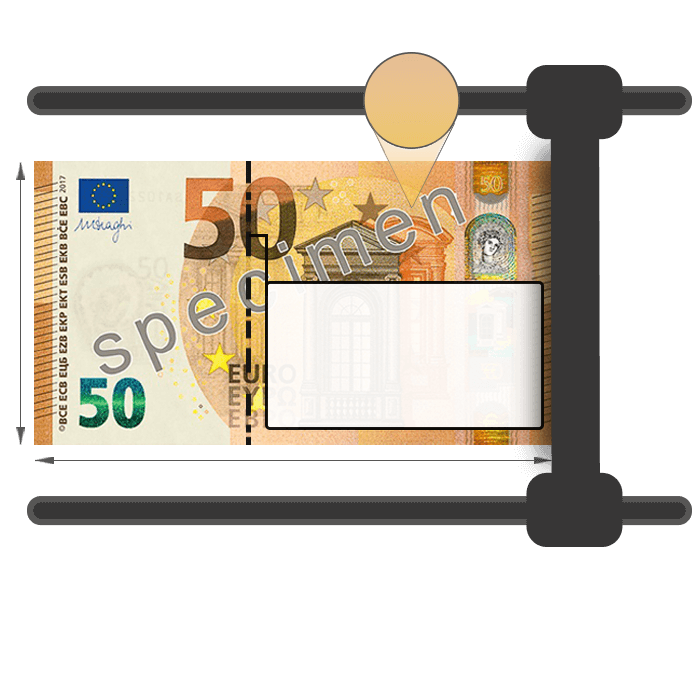 This device determines the value of the banknote by determining the colour, size and by reading the magnetic code (security thread in the center). The recognition of the colour of the banknote is realized by our sophisticated sensor unit. 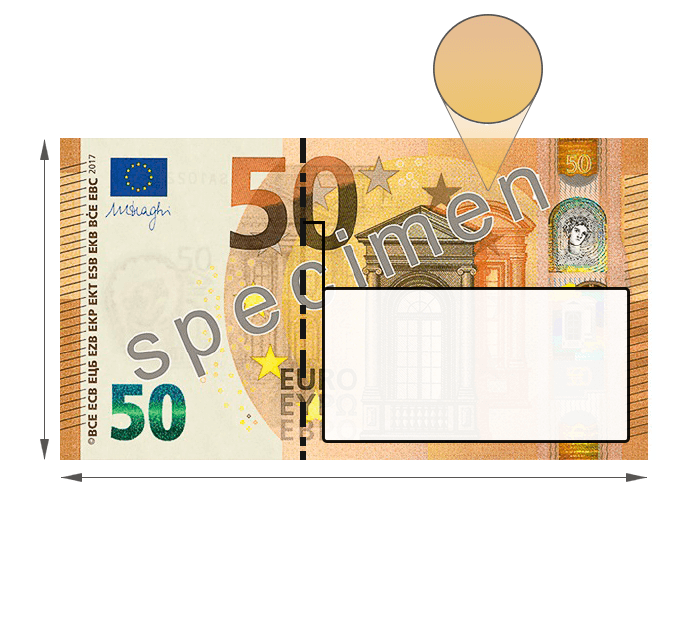 In addition, the banknote is measured in height and width by the further developed light barrier technology. 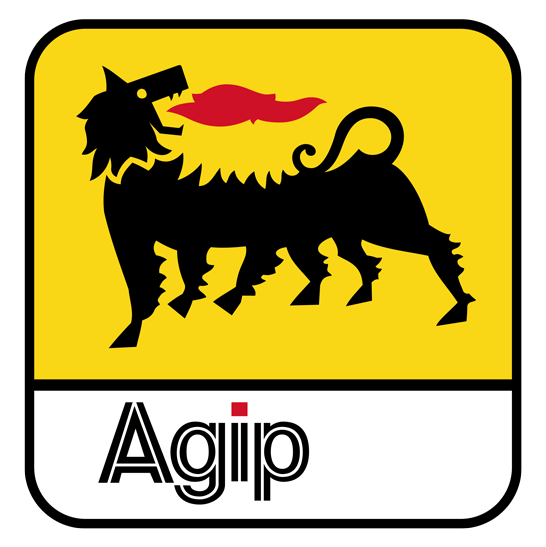 By a combination of the values of the magnetic codes, the dimensions and the colour, a high counting accuracy can be achieved. 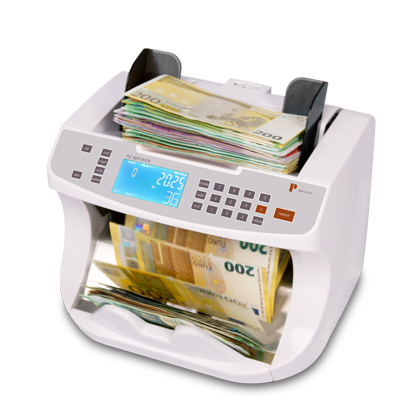 The banknote is scanned with a duplex scanner, detected by image comparison and assigned.